Nurture family time and connecting with friends by planning a Great Escape! Just 30 minutes from Nelson airport, Wakefield is surprisingly central to all the action. Tasman's Great Taste Trail passes at the end of the road. Nelson is a mountain biking mecca with an abundance of mountain bike parks nearby (within 30 minutes drive). Kaiteriteri and Nelson Lakes offer great riding too (within one hour drive). Your hosts love to explore on mountain bikes and motorbikes and can offer useful advice and guidance. Acres and acres of Hops, Grapes and Apples in the area equals one thing - great breweries and wineries! to be explored within an easy drive. We don't boast blazing fast fibre speed, or 50 channels of SKY entertainment or freeview tv (your favourite TV programmes in Digital quality)....We don't because we, by contrast, can boast being in a little kind of 'safe zone' tucked behind the beautiful hills. With no wifi or tv there's plenty of time for real connection!! Everything is provided for good old fashioned entertainment. A selection of classically awesome DVD's - projected like a movie theatre, games like Knuckle Bones where the adults can beat the kids! and a selection of books -informative interesting and strange. The cottage has a peaceful charm, an inviting warmth and comfort - just what's ordered at the end of a fun filled day. Children must be supervised. Electric fences and ponds are located on this and surrounding properties. Be aware that it is not a fully fenced property. Our Burmese cat and Cava-Tzu dog may take themselves for a walk to visit. Please be aware of this if you have pet allergies. We ask them not to but they just won't listen. Every day we wake to a melodious dawn chorus of bellbirds and Tui's singing outside our bedroom window. We have the amazing top of the South Island as our playground. I often wonder why we would want to go anywhere else?… But of course there is so much beauty and wonder yet to be seen! Our current motto is "don't leave home till you've seen the country" and with our mountain-bikes, off road motorbikes and adventure motorbikes, we want to explore every corner of our beautiful country and meet great people. 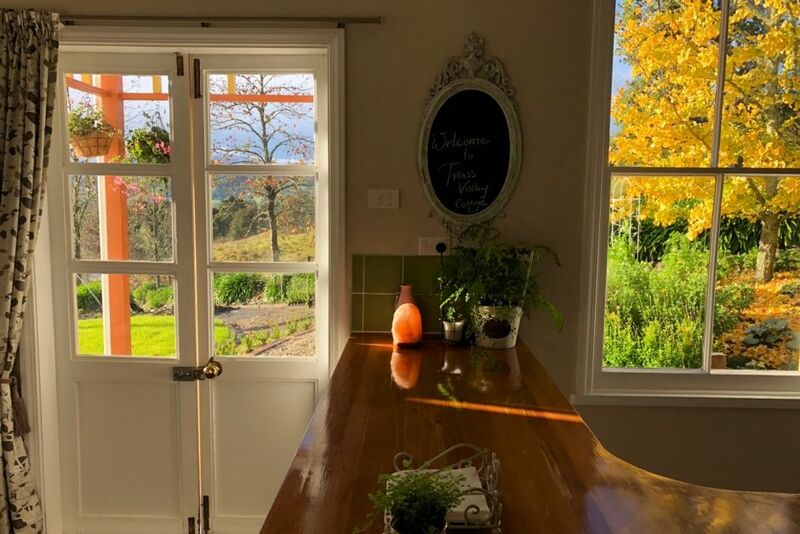 We live on a sublime hillside within a peaceful valley and offer separate retreat type accommodation in the form of a delightful and spacious three bedroom cottage. We enjoy meeting people that want to take a break from the hustle and bustle of their normal lives. Another motto we live by is to leave things better than we found it, and that includes our own land and environment and anywhere we happen to stay. There are other applications to that motto as well -family, relationships etc. I love and live holistic health and balance and have worked in nursing education mostly. Sams'engineering and my nursing backgrounds have proven to be a great combination, a marriage of ideas and doing, social and practical, emotional and logical. "Unplug, slow down, get close to nature....Make space for adventure and exploring" This is what Sam and I believe in and live. Our aim is to share our way of living through sharing the delightful cottage on our property. The picturesque Nelson Lakes are only a 40 minute drive, from there Rainbow ski-field is close by. The Trass Valley stream flows through the valley, meeting the Wai-iti river as the valley opens out beside SH6 at the end of our road. The best bach experience we have ever had. Thank you so much Lessa and Sam. It is cosy, warm, tidy, clean.. and the list goes on. It had everything we could imagine, so very thoughtful and considerate. And lovely to meet the check out manager Joey. We are definitely coming back! We loved our stay here. The cottage was gorgeous and spacious. You can tell a lot of thought and love has been put into this place. A big thank you for the chocolate and milk left in the fridge for us. Only a 30min drive to Nelson. A great place to base oneself while exploring the area. Wonderful property, location, and hosts! Wish we could have stayed longer. No wifi, but we could get weak cell service from Spark and Vodafone. If its peace and quiet you are after this property ticks all the boxes, we loved having no cell reception or wifi, there was no choice to do anything other than relax. WIth 3 kids we found it the perfect size, big enough that we weren't falling over each other but small enough to have that lovely bach feel. Location was great as only a short drive from many many wonderful things to do in the Nelson region. This is the curriest cottage. Every detail for a perfect stay has been attended too. Lessa and Sam have created the warmest of warm settings that match their generous hospitality. Peaceful, quiet tranquil, the perfect place to unwind, enjoy a book and leave the digital world behind and discover good conversation, over a glass of wine. Love this place! The house was beautifully presented, with great attention to interior décor and detail. A lovely quiet situation, with a pleasant view across the valley. Everything was very comfortable, and the owner was extremely friendly, kind and thoughtful.